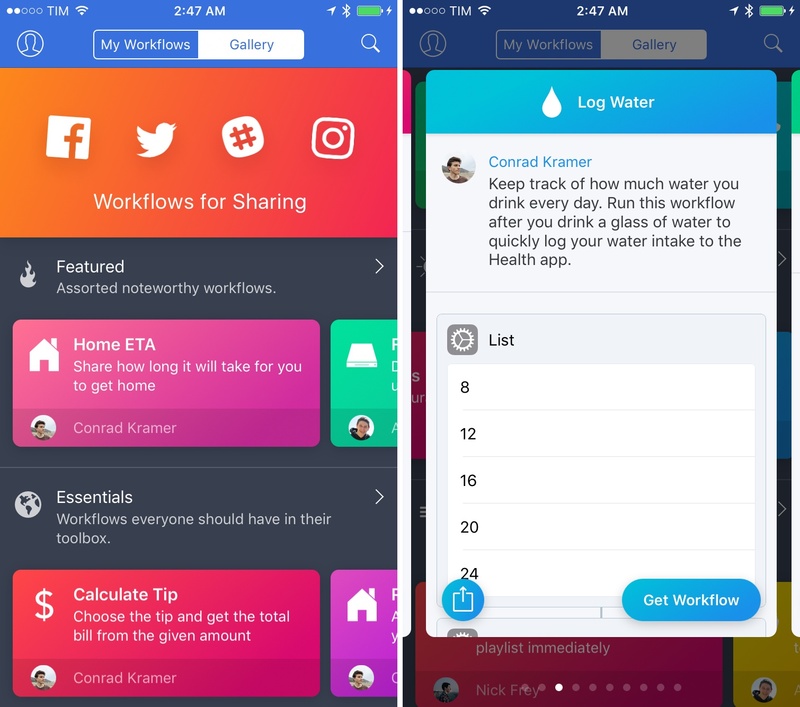 Since version 1.0 launched nearly two years ago, Workflow has always offered the ability to share workflows with others. While somewhat simplistic, Workflow's 'Copy Link' button has allowed the proliferation of sites and communities aimed at sharing workflows with the app's users – here at MacStories, workflows are one of the key aspects of our MacStories Weekly newsletter, for instance. With version 1.6, launching today on the App Store, the Workflow team is revising some of the features that have been in the app since the beginning, starting with the Workflow Gallery and major updates to how workflows are shared, installed, and explained to other users. The biggest change to Workflow is the new gallery, which has been completely redesigned and reorganized with a richer front page, superior workflow presentation, and user profiles. From a visual standpoint, the difference with the old gallery is striking. 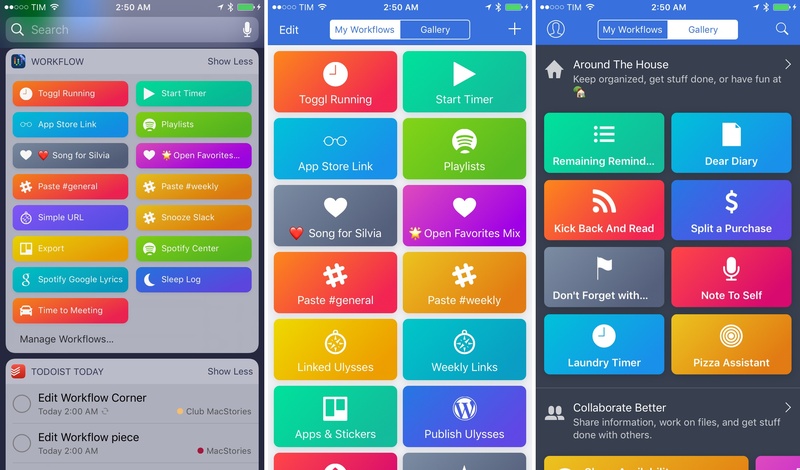 The Workflow team has been moving to a fresh design style that uses gradients, drop shadows, and button-y buttons to blend the best aspects of the pre-iOS 7 UI era with modern aesthetic preferences. I love it. This design language is now shared across the gallery, the app's widget, and the main library view, but I would like to see it applied to certain elements of the workflow editor as well. 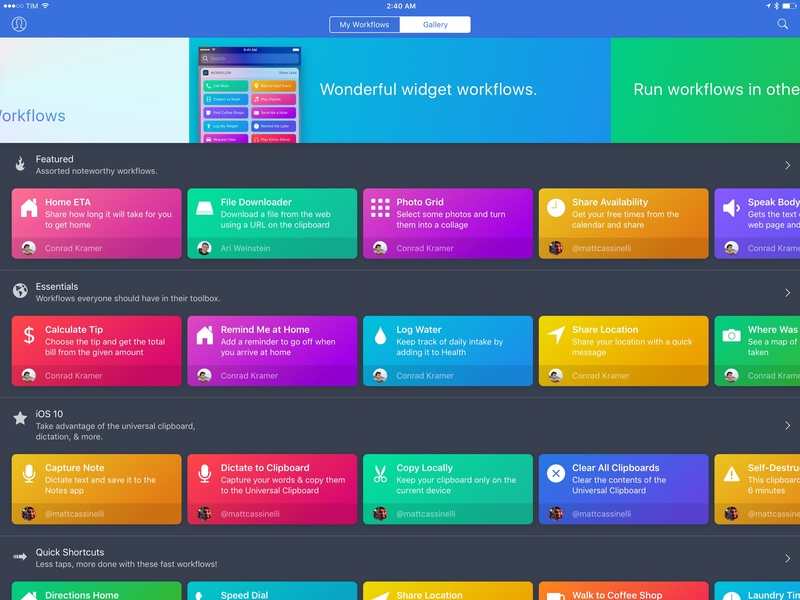 The new Workflow gallery feels fresh and colorful, but its improved looks only tell one half of the story. The Workflow team has created more curated categories of useful, hand-picked workflows to get you started. Not knowing what Workflow can do has been one of the app's greatest challenges to date: how do you explain something that can become anything? The developers' response with the new gallery is the right one. There are featured workflows with an assortment of noteworthy automations, essential workflows and workflows for iOS 10, themed collections for common activities such as music exploration or Maps, and more specific sections like Stay Healthy, News Junkies, and Learn Something New. 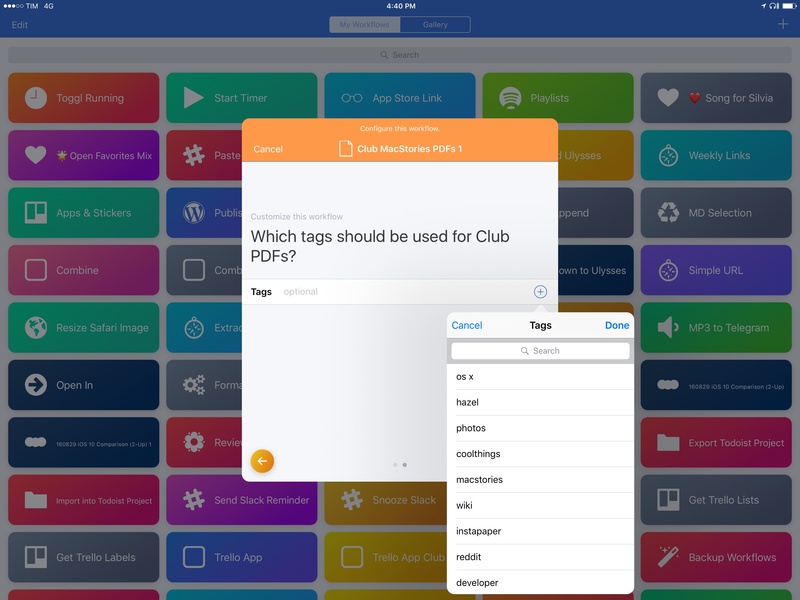 You can search workflows in the gallery (with suggestions provided in the search interface) and, like the App Store, there's a rotating carousel of featured workflows on the front page, which currently features workflows to be used as action extensions, Apple Music workflows, widget workflows, and more. Whether you've just downloaded Workflow or if you're a seasoned Workflow user, you'll likely find some useful workflows here. Workflows from the gallery are previewed as rich cards that showcase their functionality and give you an idea of which actions are used. You can download and share workflows directly from the preview card, and you can also swipe to navigate between multiple workflows in a section. I believe this is the kind of curation that should help make Workflow less intimidating and, hopefully, interesting over time if the Workflow team keeps updating the gallery alongside the app's feature set. But the Workflow team hasn't stopped at revamping and extending the gallery. With Workflow 1.6, you can now create a public profile that highlights the workflows you've submitted to the gallery. Upon submitting a workflow, you can choose a name and enter a short and long description that will be displayed to users in the gallery. This can be done from the workflow editor via the sharing dialog, or you can hit the 'Submit your own workflow' button at the bottom of the gallery. On your profile, you can include a profile picture, a link to your website, and your Twitter username for attribution. Sharing a workflow as you've always done and submitting one to the gallery aren't the same, however. The Workflow team is taking an Apple-like approach with workflows submitted to the gallery: submitted workflows will go through a review process to ensure they "make sense, work properly, aren't the same as ones that are already published, aren't malicious, don't encourage copyright violation, and are appropriate for all ages". According to the Workflow team, workflows that meet these criteria will be approved in the gallery; the "especially great" ones may be featured on the front page and in curated sections. I don't think we should expect hundreds of new workflows to be featured every week – something that would defeat the very purpose of showcasing the best and most useful workflows. But, I believe investing in the Workflow community and its creativity is the right approach at this point in Workflow's life, and I'm curious to see how the gallery will evolve throughout the next few months. 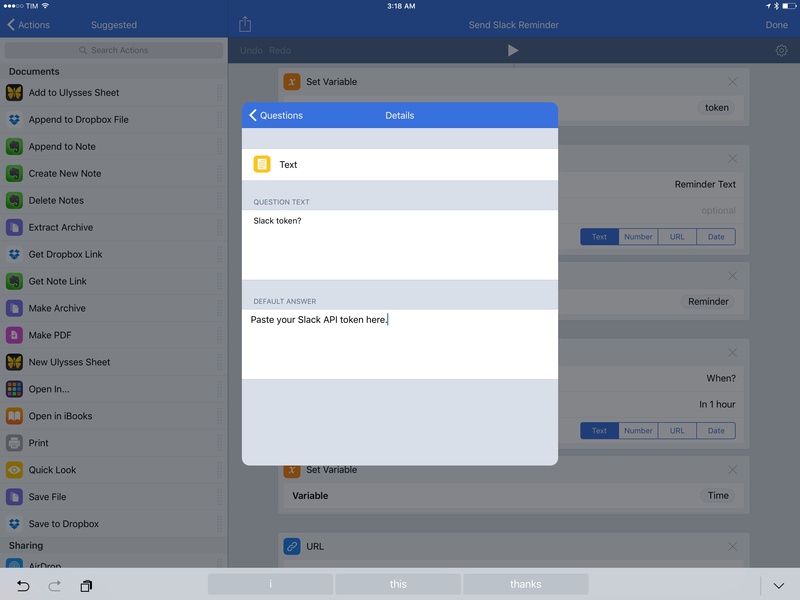 Every time I write about Workflow or cover it on Canvas with Fraser Speirs, I hear from iOS users who are interested in the app but don't know if they need it, what they can do with it, and how to get started making workflows. The new Workflow gallery looks great, it already features dozens of fantastic workflows, and it's a good first step towards the bigger goal of making Workflow more approachable for everyone. In addition to browsing and downloading public workflows, Workflow 1.6 brings a new option to share workflows and let others easily configure them to their needs: import questions. Import questions let you create questions that will be asked when a workflow is imported on another device. 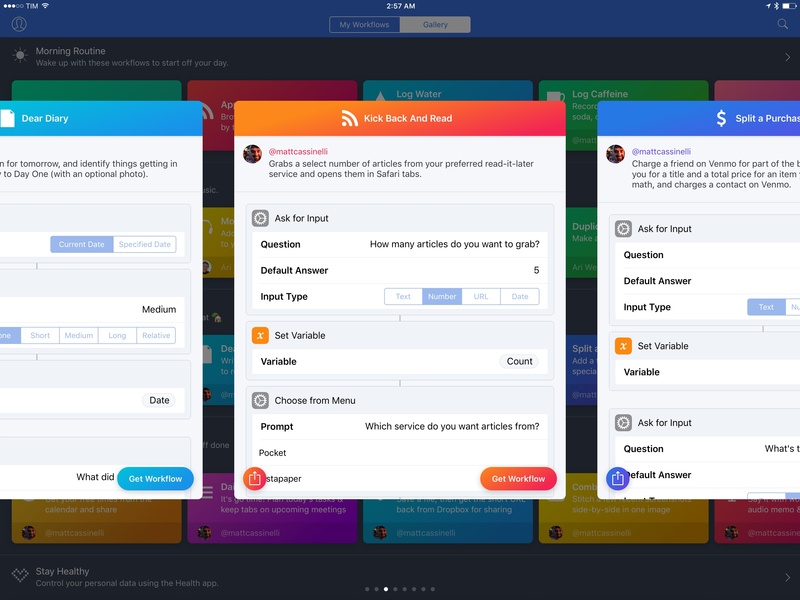 Answers to questions are automatically filled into a workflow, essentially providing an onboarding tutorial for users who have downloaded a workflow and need to change some values or tweak actions before running it. They can be created from a workflow's setting screen and they're managed by an interface that guides you through picking actions that should be answered upon installing a workflow. Selecting actions for import questions. Multiple import questions for the same workflow. Import questions are a solution to the problem of sharing a workflow that has to be updated for someone else with slightly different action settings or variables. Perhaps you want to share a workflow that includes a private password or an address, or maybe you want to let other people decide if an action should have a certain option or not. Instead of including Comment actions or placeholder text inside the workflow to tell recipients what they need to do for a workflow to run properly, you can add import questions to actions and let the app present a special importing UI when the workflow is installed on another device. Import questions are an elegant way to tweak the shared version of a workflow and prepare it for other users. And the best part is – import questions can be associated with any action in a workflow and they let you enter the text of a question as well as a default answer for what an action expects. Imagine, for instance, that you want to share a workflow that contains a Text action with an address. 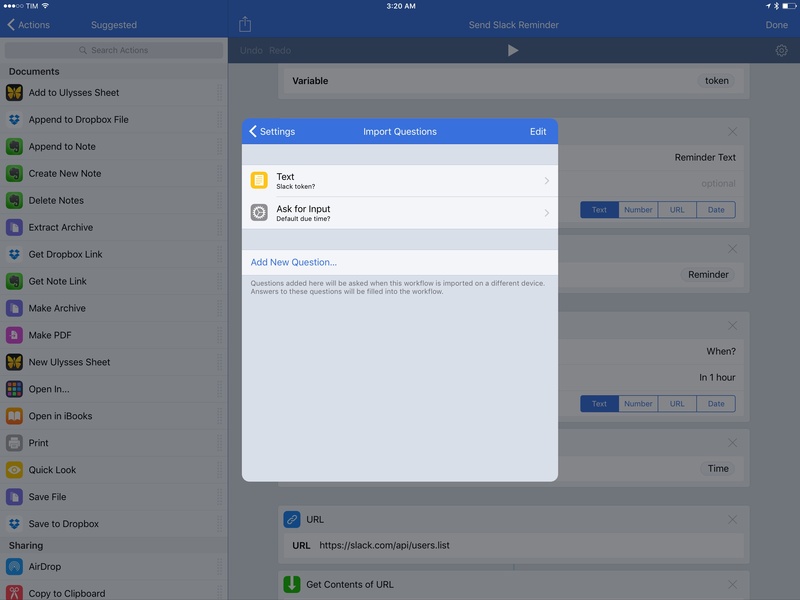 With Workflow 1.6, you can open the Import Questions screen, choose the action that requires a question, and enter the question's text and default answer. When you share the workflow, the public version won't carry your private information, but the local version already on your device will retain the data you've entered and the workflow will keep working as normal. On the recipient's end, upon importing a workflow they'll be asked to configure it by answering your import questions. After going through each question, they'll be able to use the workflow. As someone who shares workflows on a weekly basis, the addition of import questions is going to fundamentally improve how I can create workflows for readers and members of Club MacStories. If I know a complex workflow could be tricky to explain in text, I can now rely on the step-by-step guided process of import questions to make sure people can properly configure a workflow beforehand. This will reduce the time I spend providing support for workflows, and, generally speaking, it'll allow everyone to share workflows publicly with fewer concerns and better tutorials than classic comment actions. One detail I wish had been implemented differently: for complex workflows with dozens of actions, it'd be easier if import questions could be attached to individual actions from the editor, or if the dedicated question management UI had a toggle to show the local setting of an action to remember what it does. Despite this edge case, I think everyone should start using import questions for workflows they intend to share. From an action standpoint, Workflow 1.6 brings much needed improvements to the 'Choose from List' action, plus changes to dictionaries (the latter introduced with the last major update). 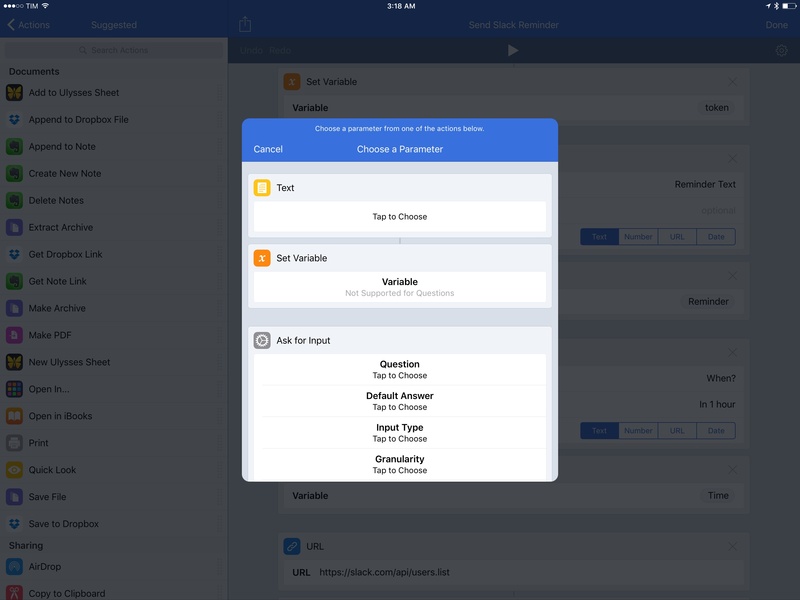 The 'Choose from List' action can now present rich data for many types of items including contacts, locations, iTunes and App Store products, RSS entries, and dictionaries. This is something I've long wanted 'Choose from List' to support: contacts are now displayed with profile pictures, while apps have icons and details for pricing and locations provide addresses and distance directly in the list. The 'Choose from List' action was the perfect candidate for a richer presentation of items powered by the Content Graph engine, and I'm glad to see how this change is making my workflows faster and more useful. App Store results presented in a rich list. In my new App Store Link workflow, for example, I can search for iOS and Mac apps from Workflow like before, but now results come up alongside icons, the name of the developer, and price of each app. The list isn't just a bunch of text buttons anymore; it's also more than a cosmetic improvement as it helps me confirm results more quickly by looking at their rich entry. If you deal with workflows that present list of locations, songs, or contacts, you're going to enjoy the newfound capabilities of 'Choose from List'. This is one of my new favorite actions to use as much as possible. Dictionaries – one of the keystones of Workflow's web API support – are now easier to recall as they can be integrated with 'Choose from List', too. A dictionary can now be passed to 'Choose from List' and you'll see keys used as button titles and values as smaller subtitles; when you choose an item, only the value (without the key) will be passed as output. Opening Spotify playlists from a dictionary. This allows you to use pretty names for dictionary keys while retaining the ability to preview values upon choosing from the list. 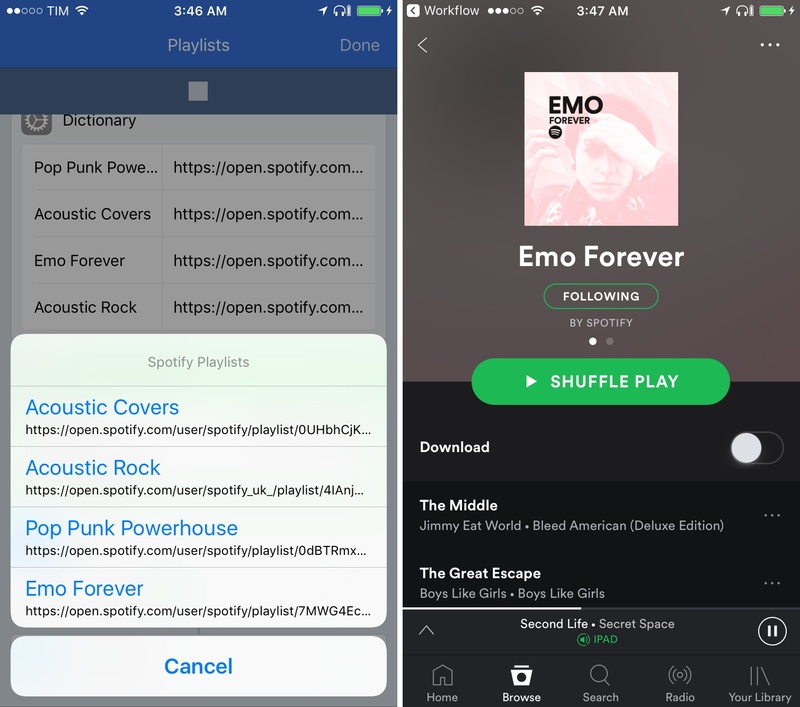 I've updated my Toggl workflows (detailed here) to take advantage of these dictionary improvements, and I've also created a new Spotify workflow to choose a public playlist from a dictionary presented as a list. 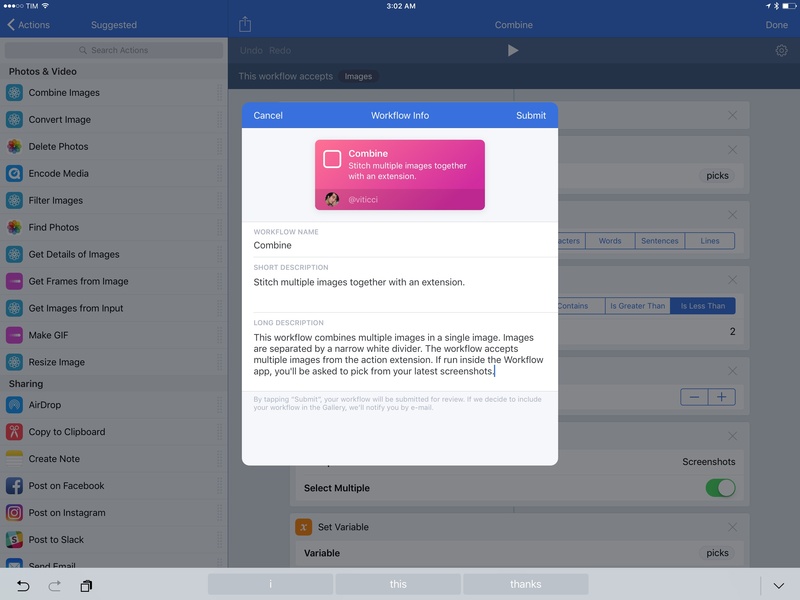 Version 1.6 of Workflow rethinks some of the longstanding limitations of sharing, combining a promising gallery effort with better tools to share workflows with other people. 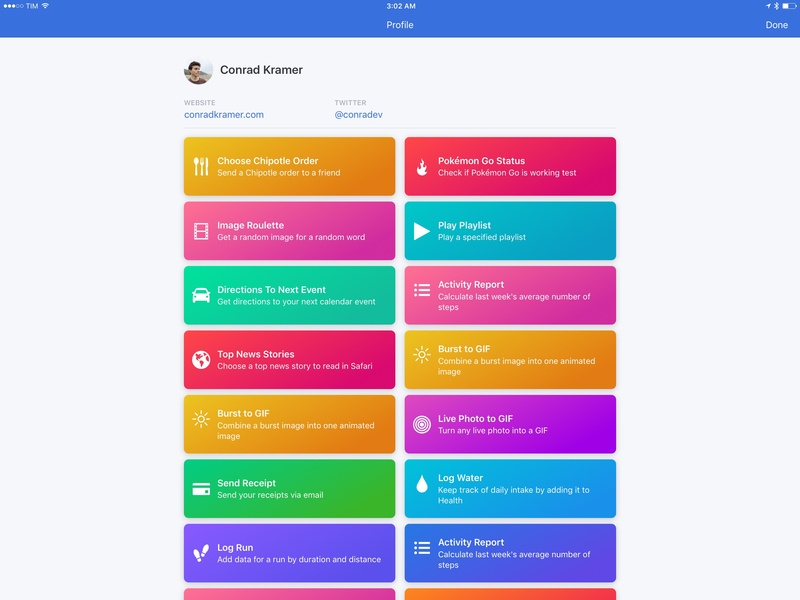 Almost two years into the app, it's time for the Workflow team to address other areas such as variable details, folders, and custom action presets; with today's release, they'll get there with a stronger foundation for everyone. 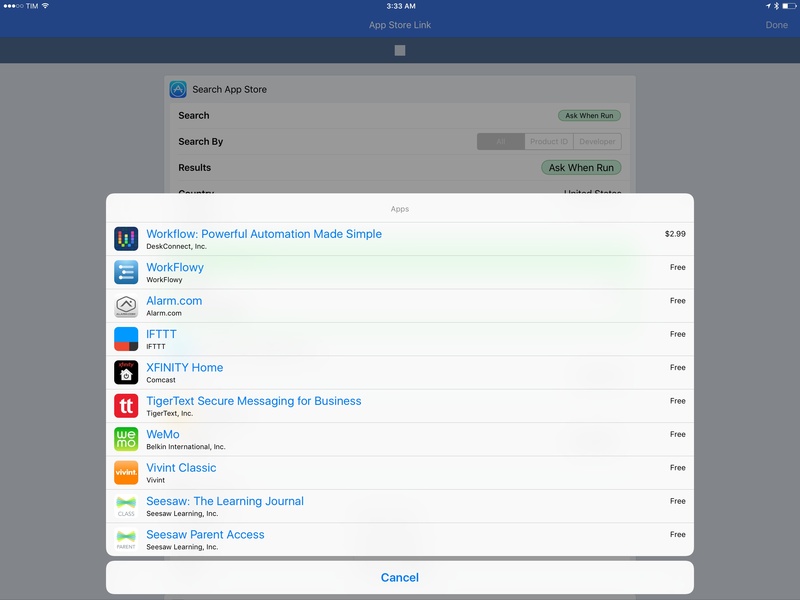 Workflow 1.6 is available on the App Store.